The floating, suddenly appearing rings are only there to distract you. Focus on the path ahead! It's probably fair to label Fotonica an endless runner, much like Canabalt, Temple Run, and a seemingly endless array of other mobile genre options—but that familiar tag seems way too pedestrian for a game so daring, exciting, and effortlessly engrossing. Fotonica looks like what many of us still imagined virtual reality was before the Oculus Rift went and modernized the experience, sending you sprinting and leaping through a sparse, barely-there world from a first-person perspective. Ensuring you always have a platform beneath your feet is the main goal as you bound across gaps of endless black nothingness. But as you build up incredible speed, the pathways and trippy backdrops take on a blurred yellow tone, and that's when everything clicks: the chaotic pace and flitting wireframe graphics are perfectly juxtaposed by the cool soundtrack and dead simple controls. It's a powerful, exciting sensation, and one you'll continually strive for as you navigate the standalone levels and endless stages. Ready to dive into this lo-fi curio? 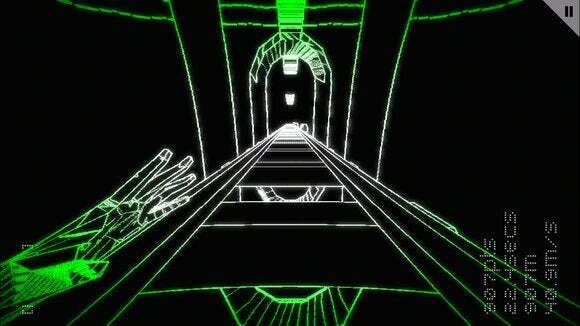 Here are three of the brightest spots of this deceptively dazzling first-person experience. The stage that begins with you running through a house is such a surprising thrill the first time around. It's a dream world: I have probably snagged screenshots from several hundred mobile games in my career, yet none has proven as challenging as Fotonica. You just can't capture the wonder of these mostly-monochromatic (dashes of color appear here and there) levels with a still frame—believe me, I tried repeatedly! Despite all sharing a basic core aesthetic, each level feels totally distinct, whether it's the pattern of platforms you can run and land upon, or the visual highlights within. Some levels try to draw your eye with wild patterns in the backgrounds, or flashing effects that appear while you run. Others pack in surprising detail, particularly one stage that finds you running through homes and across billboard ledges. And Fotonica's presentational prowess isn't confined to simply visuals, as the paired electronic soundtrack is a fantastic match, and it really helps propel you further and further as you inevitably perish time and again. A perfect fit for iOS: Before landing on iPhone and iPad, Fotonica began life on Mac and PC, and you can even find it on the Ouya microconsole. While I'm sure it's a great experience with a controller or keyboard, Santa Ragione's game is such an excellent fit for touch devices that you might be surprised to find out that it wasn't designed solely for its App Store debut. While all unified by a similar aesthetic, each stage is visually distinctive in its path designs and backdrop imagery. A lot of it comes down to the one-thumb design: you'll hold down a finger to start running, and then release it to leap. Holding down on the screen while in midair forces you to crash back down to a platform below—or alternately, if poorly timed, to your demise—and you'll need to do so to ensure a landing spot at times and try to maintain your momentum. But even beyond the controls, it's the rare first-person game that's ideally suited to mobile. The minimal visuals show well on an iOS screen, and the ability to plug in headphones and get lost for a bit is great. It has surprising variety: Even with the bare-bones controls and super-simple core visual aesthetic, Fotonica shakes up its routine enough to stay interesting. The seven primary stages challenge you to stay alive to their completion, with a variety of vertical paths letting you choose your own path to the goal. Meanwhile, the three endless stages provide a constant array of platforms to bound between, with the goal of staying alive for as long as possible and setting a high score. And you can even play Fotonica in local split-screen competitive multiplayer, whether you're rocking an iPad or an iPhone. Sure, Fotonica fits the basic description of a runner game, but it's more adventurous than many of its contemporaries—both in style and spirit. Despite origins on other platforms, it proves a perfect fit for quick-hit mobile sessions and proves to be a pretty enrapturing one-thumb experience.